Striped triangles – how much yarn? This is a variation of a conversation I had on Twitter last week. Say you’re making a triangle shawl that’s going to have two stripes. How much more yarn will the second stripe take than the first? The stripes are going to be different sizes because it’s a triangle. Here is a simple method to approximate the relative amounts of yarn. Note: Exactly how much yarn is needed will depend on the thickness of your yarn, your gauge, and your stitch patterns. If there are different stitch patterns in different stripes, they will probably have different amounts of yarn for the same area. Each of those triangles is the same size, so each of them will take the same amount of yarn (so long as the stitch pattern is the same density). 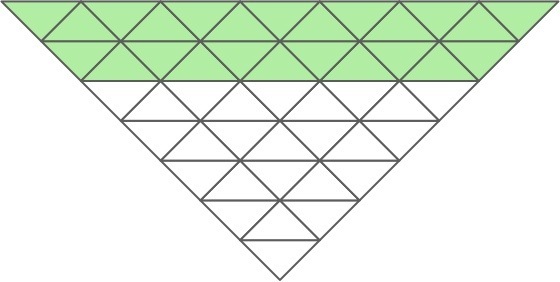 If you count the triangles, there are three in the second stripe and one in the first. Therefore, you will need three times as much yarn for the second stripe. 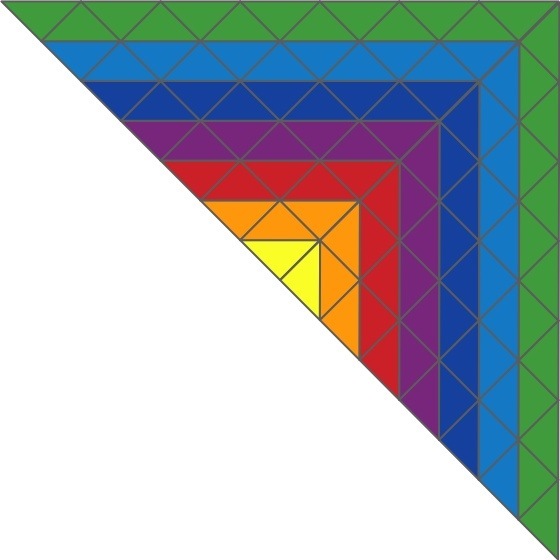 Four triangles in the inner wide stripe; five in the narrow outer stripe. So you would use 400 yards of white for every 500 yards of green. 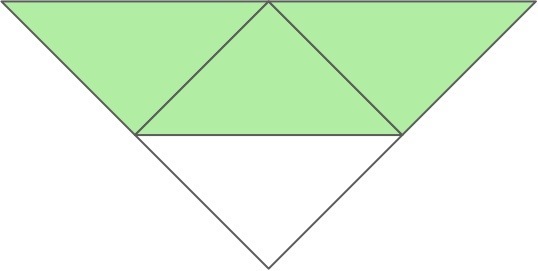 There are 25 triangles in the white section; 24 in the green. That leaves an extra green triangle’s worth of yarn. 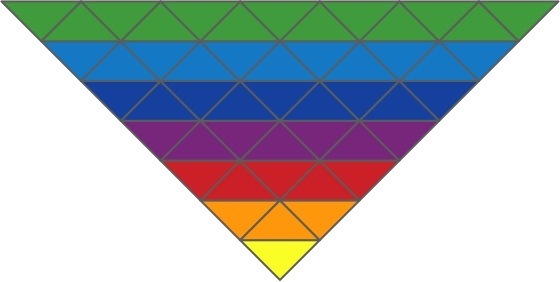 One triangle in the yellow stripe, 3 in the orange, 5 red, 7 purple, 9 indigo, 11 blue, and 13 green. Notice something? As you add stripes in the same width, the length increases by two triangles. 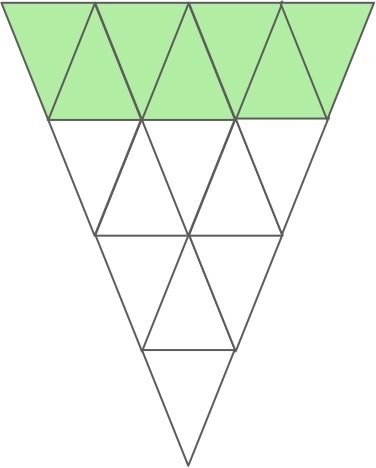 What if you’re making this kind of triangle? Turns out that the ratios are the same, because you’ve simply multiplied everything by two. 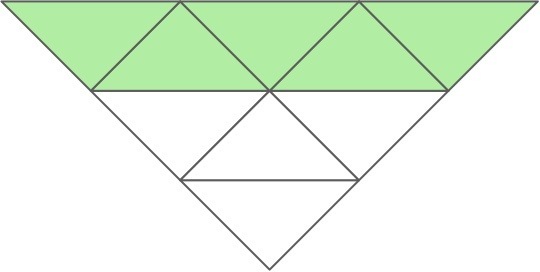 What if you’re making a triangle that’s not a square cut in half diagonally? So clever! Thanks for sharing this. Your ability to see mathematical relationships is awesome! That is an excellent visual! Very nice.